Anyone that has ever passed through Columbus is probably aware that there's a football team in town called the Ohio State Buckeye's. But just what is a buckeye and why would anyone make a buckeye their mascot? The answers might surprise you. My father grew up in western Pennsylvania and didn't move to Ohio until the 1940s. So he wasn't indoctrinated into the culture of The Ohio State Buckeyes like those of us that grew up around all the hoopla. In fact, my father always said that buckeyes were nothin' but a worthless nut-- meaning, you couldn't eat a buckeye. Of course, he never tasted one of Anthony Thomas' world famous "Buckeyes" but that's another story. You've probably heard that the buckeye tree is the official state tree, but why not an acorn tree or heaven forbid a walnut tree? Can't you just imagine a huge "fighting walnut" dashing around in the Shoe on a Saturday afternoon? In fact, there seems to be plenty of other, more plentiful nut bearing trees in Ohio than the buckeye tree. So the choice of the buckeye seems puzzling. The answer, as with most traditions, goes back to when Ohio was first being explored by early settlers coming across the Appalachian mountains. Now these folks were good ol' boys right down to the core. They knew just about everything there was to know about farming, plants and especially about wood. Their entire lives literally revolved around and depended upon wood. They knew which wood would burn best on a cold winter night, which wood was the easiest to cut down to build a house, which wood could be carved to make tools. They were wood geniuses. Well, when these woodsmen came into the Ohio Territory, one of the first things they noticed, besides the land being a little less mountainous, were these trees Native Americans called "hetucks" or roughly translated "buck" referring to deer. The early pioneers had never seen these trees before because the trees were native to Ohio. But that still doesn't explain why Ohioans are called buckeyes. Before Ohio became a state, a Colonel from the Revolutionary War named Ebenezer Sproat led a delegation of settlers in a meeting with some of the Native Americans around Marietta. Now, Ebenezer was a pretty good sized man at 6'4". In fact, he would have probably made a good buckeye linebacker. This was at a time when the average height for a good sized man was around 5'8" or so. So when Ebenezer walked into the room, he attracted more than a little attention when the Indians first saw his large frame. They called him "hetuck, hetuck" mean big buck. And Ebenezer was a big buck. They weren't calling him a big buckeye, like Brutus Buckeye the mascot, and they weren't saying he looked like a buckeye, just that he was as big a large male deer, or a buck, which in the colonial days was pretty big. Now, as the story goes, that name "hetuck" stuck with Ebenezer, except not many people knew what "hetuck" meant, so it got changed to "buckeye" which only a few more people understood than understood what "hetuck" meant. Ebenezer who was an early sheriff and colonel in the militia around Marietta. He became Ohio's first big Buckeye Fan. He proudly used that nickname Buckeye for himself and for the rest of his life he always introduced himself as a Buckeye. In time, it became a term that people used for anyone that lived north of the Ohio River Valley because this is where those buckeye trees grew and that is how Ohio became known as the Buckeye State. But that was only the beginning of the great buckeye tradition. The 1840 presidential election introduced the entire nation to the "buckeyes". One of the candidates running for office was William Henry Harrison. William Harrison was actually a Virginia-born aristocrat who traded his aristocracy for a more popular, down-to-earth image as a war hero and frontiersman living on the banks of the Ohio River. During his campaign for President of the United States, he adopted the buckeye tree and buckeye nuts as his official campaign symbols. At the Whig convention, Harrison's delegates carried about wooden buckeye canes along with decorated beads made of dried buckeye nuts. These buckeye nuts were the forerunner of today's campaign buttons. Even after winning the election, it is rumored that Harrison carried around a lucky buckeye nut in his pocket. After this campaign the buckeye became totally linked with Ohio and became one of our many traditions like football. It's kind of rare for an athletic team to be named after a tree, but the Buckeye name is so ingrained in the history and lore of our state and the university that few stop to consider how unusual it is. The buckeye tree is native to Ohio, it's tenacious, attractive and unique -- all traits that Ohioans and Ohio State alumni are proud to be associated with. And if you look at the shell a buckeye nut comes in, you'll see it's kind of prickly too! Today, one of the more visible symbols of Ohio State athletics is Brutus Buckeye, the school’s mascot. Brutus first appeared in 1965 at a football game. (that year, Ohio State beat Michigan 9 to 7). Over the years Brutus Buckeye has taken on a variety of shapes and configurations. 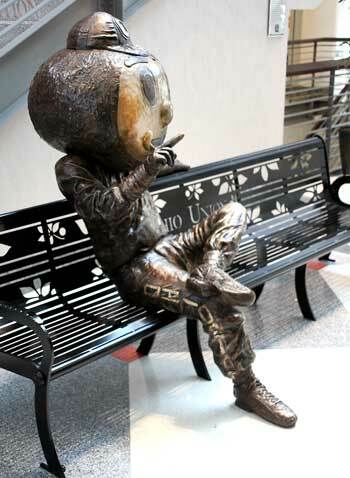 Although the most recent incarnation has been sculpted in a variety of outfits that can be seen across campus, his immortalized image has been cast in bronze and resides in the new Ohio Union. Ohio State University graduate, Renate Burgyan-Fackler was asked to cast the most famous Buckeye in bronze for the 2010 opening of the new Ohio Union building. She took great pains to get the seated figure just right, down to the smallest detail. Renate spent 8 months sculpting the figure out of clay. Once this was complete, wax molds were taken to complete the sculpting process. The final sculpture was cast at Coopermill Bronzeworks in Zanesville. This resulted in 20 different pieces that had to be welded together to complete the sculpture. Student Ray Bourhis, along with other members of the student organization Ohio Staters Inc., convinced the OSU athletic council of the idea of a Buckeye as Ohio State’s mascot. At the time, other schools used animals for their mascots and actually had the animals present at the games. Bourhis thought the only animal fitting for Ohio would have been a buck deer, but bringing an actual big buck to the games would have been a little difficult. He opted instead for a buckeye nut to be the model for the Ohio State mascot. What else can you say: sometimes you feel like a nut, and sometimes you don't. On October 30th, a big, crazed looking Buckeye mascot first appeared at the OSU vs. Minnesota Homecoming game (OSU won that game 11-10). This large paper mache shell received lots of support by the 1000s of Ohio State fans at the game on that Saturday afternoon. But, as anyone that has ever sat up on C Deck can attest: it will rain in the Shoe every so often. And the big problem with paper mache is that it just doesn't work well in the rain. So the mascot group had to come up with a better solution. Now we go back to my father and his feelings on buckeyes being worthless nuts. I can remember him telling us that this group of OSU students came to the shop where he worked and they wanted him to fabricate this giant buckeye contraption using fiberglass. He said, "Can you imagine these kids want to run around with this big, heavy fiberglass ball over their head at a football game? What can they be thinking? A bunch of worthless nuts!" Little did he realize at the time, the importance this big nut would play in Ohio State's rich traditions. 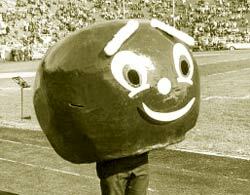 The big buckeye later got a name: Brutus Buckeye. Some people call him: Brutus the Buckeye, but it's really just Brutus Buckeye. This was probably the best name possible for a mascot that wasn't anything more than a worthless nut. That large 40 pound fiber glass shell that my father helped build, was soon retired after a season or two when it turned out that Brutus was more exhausted after a Saturday afternoon home game than the opponent's linebackers. Over the years, Brutus has gone through multiple updates, and today he is more lightweight and agile, better suited for a mascot's demanding appearances throughout the year. I think my father would have liked the way Brutus looks today, he's only gotten better with age. Ever want to plant your own buckeye tree? First, start with a viable seed (one that hasn't dried out, become soft, or shriveled). Plant the seed in the fall about 3" deep, in loose, well worked soil. Plant more buckeyes than you will need since only about 50% will germinate. Place 2 - 3" of mulch over the top of the buckeyes (straw or well rotted sawdust works nicely). The mulch will help hold the soil in place over the winter and should be removed in early spring after the ground thaws. Keep the soil moist but not wet until after the seed has germinated. Apply water as needed to maintain about 1" per week. Lightly fertilize with a balanced fertilizer once per month. Water and fertilizer should be stopped by mid-August to allow the seedling sufficient time to harden off before winter. Squirrels tend to dig up seeds and nuts. If you are planting where squirrels are abundant, place a screen mesh over the planted seeds before covering them with mulch. Remove the screen in the spring when you remove the mulch. Select optimum buckeyes and place them in a plastic zip-lock bag along with damp peat moss (not soaking wet). Put the bag in the refrigerator out of the way. After about 4 months, remove the bag from the refrigerator and plant those seeds that have germinated into a small pot with potting soil. Keep watered. As the plant matures during the first season, transfer it to a slightly larger pot. Once the seedling is about 2' tall, plant in the desired location.